Flood damage from Tropical Storm Irene (2011) in Waitsfield. Floodplains serve important ecological functions but these areas, prone to inundation and erosion from flash flooding, can also be hazardous to human life and property. 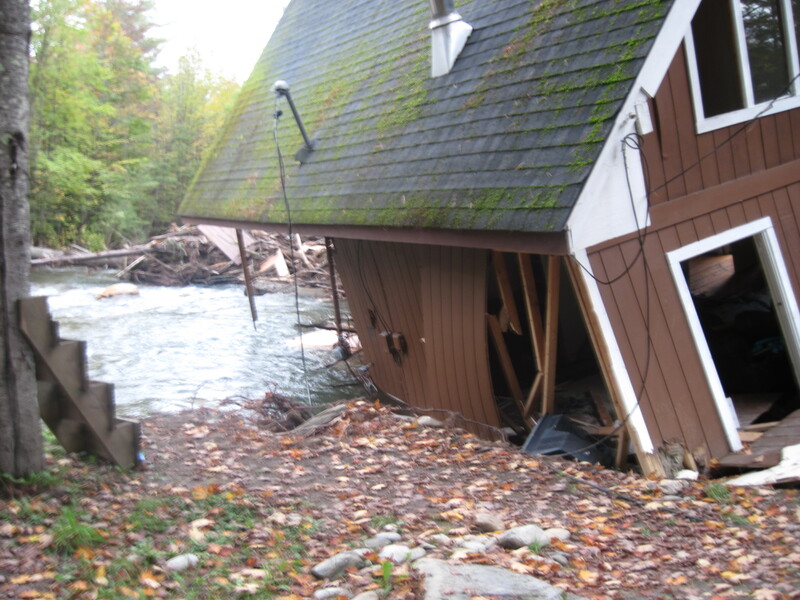 Arising from a variety of causes, including heavy rain, melting snow, ice jams, poor drainage, and dam breaks, flooding is the most frequent, damaging, and costly type of natural disaster experienced in the State and Central Vermont Region. In the last 50 years alone, flood recovery costs have averaged $14 million per year statewide. The following resources focus on education, preparation, and prevention in order for communities, residents and businesses to be more resilient to flood disasters in the future. 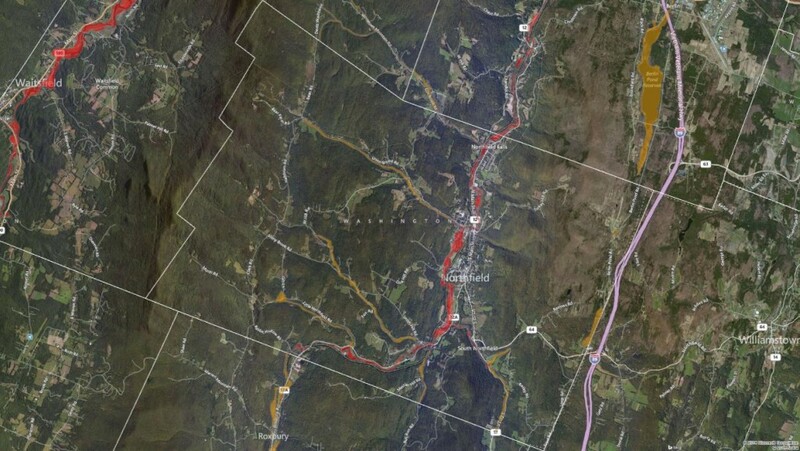 What other types of flooding put Central Vermont at risk? Is my home or property located within the Special Flood Hazard Area (SHFA)? How can I be prepared for a flood? This new online tool can help communities prepare for disasters, identify flood hazards, take action to minimize future damage, find funding to reduce risk to existing buildings, update municipal plans, and find out what other towns are doing to get Flood Ready. Click on map points to view gauge summaries and hydrographs for rivers in your area. The following towns have created Hazard Mitigation Plans to assist in recognizing hazards and identifying prevention, preparation, and risk reduction strategies to increase community resilience. Staff compiled a table of past flood events that impacted the Central Vermont Region as part of the 2016 Regional Plan Update process. Contact Laura Ranker, ranker@cvregion.com, for information. A floodplain is the comparatively low-lying land adjacent to a waterway, and is generally defined according to its frequency of flooding. For a Floodplain Basics Fact Sheet prepared by the Two Rivers-Ottauquechee Regional Planning Commission, click here. Example: The “100-year floodplain” has a 1% chance of occurring in any given year. Fluvial (or river-related) Erosion Hazards (FEH) refer to major streambed and streambank erosion associated with the often catastrophic physical adjustment of stream channel dimensions (width and depth) and location that can occur during flooding. Fluvial erosion becomes a hazard when the stream channel that is undergoing adjustment due to its instability threatens public infrastructure, houses, businesses, and other private investments. Long cold spells can cause the surface of rivers to freeze, leading to ice jams. When a rise in the water level or a thaw breaks the ice into large chunks, these chunks can become jammed at man-made and natural obstructions, resulting in severe flooding. Is my home or property in the Special Flood Hazard Area (SHFA)? Click the map above to view the Special Flood Hazard Area in your town using the ANR Natural Resources Atlas. Get flood insurance through the National Flood Insurance Program (NFIP)! Standard homeowner’s insurance does NOT cover damage from flooding. Do not wait until you are experiencing a flood or extreme weather event, as there is typically a 30-day waiting period from the date of purchase before the policy goes into effect. To learn more, continue to the next section of our webpage or click here to visit Floodsmart: Understanding the Basics. The NFIP is a Federal program created by Congress to mitigate future flood losses nationwide through sound, community-enforced building and zoning ordinances and to provide access to affordable, federally backed flood insurance protection for property owners. The NFIP is designed to provide an insurance alternative to disaster assistance to meet the escalating costs of repairing damage to buildings and their contents caused by floods. Participation in the NFIP is based on an agreement between local communities and the Federal Government that states that if a community will adopt and enforce a floodplain management ordinance to reduce future flood risks to new construction in Special Flood Hazard Areas (SFHAs), the Federal Government will make flood insurance available within the community as a financial protection against flood losses. What are the benefits to having flood insurance? Through the NFIP, property owners in participating communities are able to insure against flood losses. By employing wise floodplain management, a participating community can reduce risk and protect its citizens and the community against much of the devastating financial losses resulting from flood disasters. Careful local management of development in the floodplains results in construction practices that can reduce flood losses and the high costs associated with flood disasters to all levels of government. Use the One-Step Flood Risk Profile (red box on the right hand side of the screen) to rate your risk, estimate your premiums, and find an agent. The only information you will need to share is your address.